Seals and sea lions are taking a major bite out of the threatened chinook salmon population in Puget Sound, and the competition for food could be having repercussions for endangered Southern Resident killer whales, according to a new study. Seals and sea lions are eating about 1.4 million pounds of Puget Sound chinook each year — about nine times more than they were eating in 1970, according to the report, published online this month in the Canadian Journal of Fisheries and Aquatic Sciences. Most of these chinook are small fish migrating to the ocean, which ultimately reduces the number of adults returning to Puget Sound. The study estimates that seals and sea lions are decreasing potential returns by about 162,000 adult chinook each year. That’s twice the number eaten by killer whales and roughly six times as many as caught in Puget Sound by tribal, commercial and recreational fishers combined. Much of the chinook consumption is by harbor seals, which had a bounty on their heads from 1947 to 1960. After hunting was outlawed under the 1972 Marine Mammal Protection Act, the population of Puget Sound harbor seals grew rapidly until it leveled out around 18,000 animals, according to rough estimates. Today, the Salish Sea — including Puget Sound and the inland waters of British Columbia — is believed to have one of the highest densities of harbor seals of any place in the world, noted the study’s lead author, Brandon Chasco of Oregon State University. Meanwhile, killer whales are eating about 1.2 million pounds of chinook in Puget Sound — a number surpassed by seals and sea lions perhaps a decade ago. The orcas consume Puget Sound chinook — their chief source of food — mainly during summer months when they are in the inland waterway. The new study, which is based on a variety of assumptions, raises questions about whether competition for chinook salmon may not only impede the recovery of chinook but also limit the orca population, said Lynne Barre, who manages the Seattle branch of NOAA’s Protected Resources Division. As chinook runs have declined, human fishing opportunities have become more and more limited to protect the remaining fish. Total commercial and recreational catches of 400,000 chinook in 1980 have declined to around 30,000 in marine waters in recent years, Chasco said. The new findings, which rely on previous studies by other experts, look at both biomass consumed as well as the number of fish eaten. The biggest difference is that seals and sea lions are consuming significant numbers of small chinook, compared to people and whales that take adult salmon. Juvenile chinook, known as smolts, are often caught by seals as the fish leave their natal streams and migrate to the ocean. Although chinook make up only 6.8 percent of a harbor seal’s diet, about a third of that comes from eating the little smolts, according to estimates from the new study. In terms of energy content, it takes about 1,400 smolts at 9 centimeters in length to equal one four-year-old adult that is 92 centimeters long, the study says. Based on their caloric needs, each harbor seal may be eating up to five smolts a day at certain times of the year — for a total of more than 8 million smolts a year for the Puget Sound population, according to Chasco’s calculations. In 1970, harbor seals were eating about 1.1 million chinook of all sizes, or 13 times more individual fish than killer whales. In 2015, that number had grown to 8.6 million for the seals, or 104 times the number of chinook taken by killer whales. If one assumes that all the smolts eaten by harbor seals are from Puget Sound hatcheries, then the study predicts that the seals are eating about 22 percent of all the smolts trying to leave Puget Sound. The 22-percent figure is recognized as an overestimate, Chasco said, because the seals are eating wild chinook from Puget Sound and even hatchery fish from British Columbia — but those exceptions are relatively small compared to hatchery chinook produced in Puget Sound. The paper is sure to generate discussion, Barre said, noting that Chasco and his fellow authors on the paper are now trying to expand those estimates to the entire West Coast. Puget Sound chinook were listed as threatened under the Endangered Species Act in 1999, followed by the 2005 Shared Strategy for Puget Sound, a blueprint for chinook recovery. The plan focused on improving salmon habitat, hatchery operations and fishing regulations to restore the salmon runs. 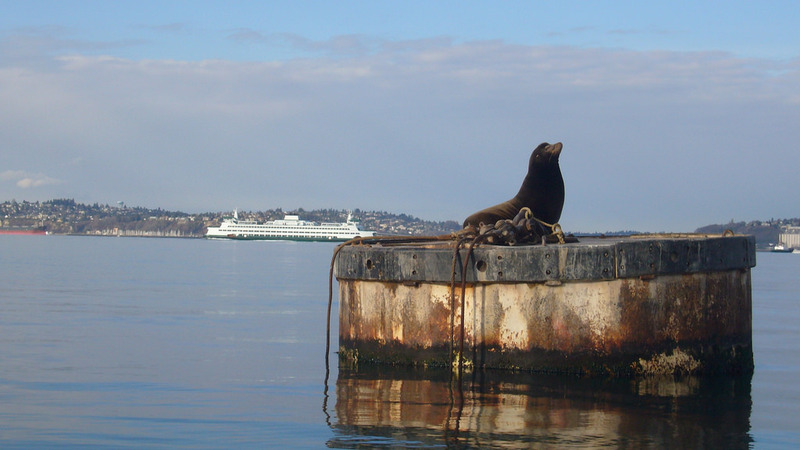 Predation by marine mammals was not addressed in the initial recovery plans for chinook, because people weren’t aware that it was a major factor, said Laura Blackmore, who helps coordinate recovery planning for the Puget Sound Partnership. 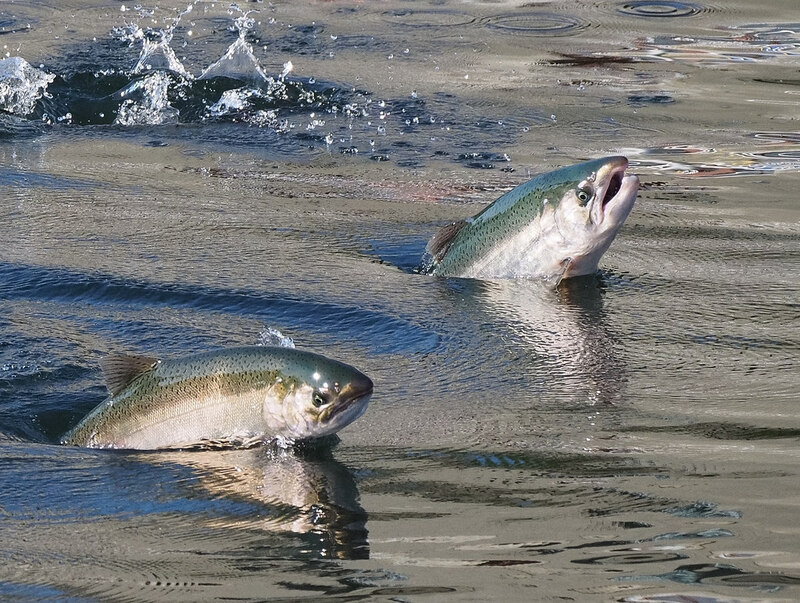 In 2014, an international team of researchers launched the Salish Sea Marine Survival Project, an effort to understand why so many chinook and coho salmon and steelhead trout were dying after they left their freshwater habitats. The research is coordinated by Long Live the Kings in the U.S. and the Salmon Recovery Foundation in Canada. Among its projects, the research team is attempting to describe the interactions between marine mammals and salmon and steelhead from the time the fish leave the streams as juveniles to the time they return as adults. Work includes “tagging” juvenile steelhead with tiny acoustic transmitters to determine how many fish leave Puget Sound and how many get eaten by various predators. The near-term question, he said, is whether marine mammals are impeding salmon and steelhead recovery and possibly contributing to problems for killer whales. While marine mammals were not a major consideration in chinook recovery planning in 2005, they are becoming an emerging issue, Blackmore said. Separate from recovery goals under the Endangered Species Act, the Puget Sound Partnership has spelled out targets for its Vital Signs indicators. One target calls for reversing declining chinook runs and increasing local populations of chinook in each region of Puget Sound. A so-called "Implementation Strategy" to meet that target could be ready as early as March, Blackmore said. An early draft of the Implementation Strategy lists “marine mammal interactions” as an issue for chinook recovery, but no specific actions are proposed. Southern Resident killer whales were listed as endangered in 2005. A 2008 recovery plan developed by the National Marine Fisheries Service listed prey availability as a major threat, along with toxic chemicals, noise, disturbance from vessels and other concerns. Food competition with other marine mammals was briefly mentioned as a potential issue, but no estimates of consumption were available for seals and sea lions at the time, and no specific actions were proposed. Recent studies have suggested that orca calves tend to be born during times when salmon runs are on the increase and that pregnant whales have more miscarriages when runs are down. If it can be shown that competition for food is restraining the recovery of Southern Resident killer whales, balancing the populations of fish and marine mammals could become a major issue. At this time, controlling the seal population with lethal or nonlethal methods is not even a consideration, said Barre. Under the Marine Mammal Protection Act, such actions would be “limited and complicated,” but not impossible, she said. California sea lions have been removed from the Columbia River near Bonneville Dam, but only after problem animals were individually identified and when other means of control — such as hazing — were proven not to work for those particular animals. 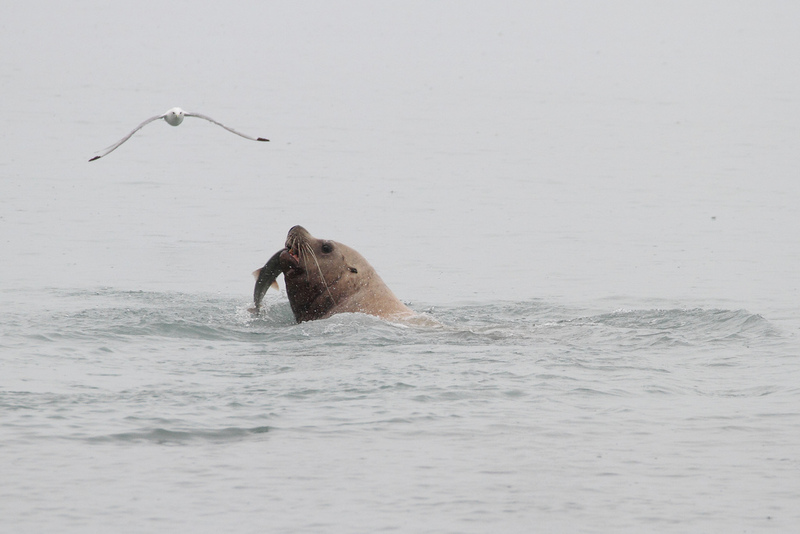 While Chasco was able to estimate the current consumption of chinook by harbor seals, California sea lions and Steller sea lions, he does not attempt to predict the outcome of any particular management action. In fact, his report cautions that no estimates were made for consumption by other known predators, including marine birds and other types of fish. Reducing the number of harbor seals or other marine mammals would make more fish available for other species, but that does not necessarily mean that adult chinook would be available for killer whales or human fishers. In fact, some researchers have suggested that a significant percentage of chinook smolts in Puget Sound are in a weakened condition — perhaps by toxic chemicals, disease or malnutrition. That could make them especially vulnerable to predation long before they return as adults. The entire food web — a multitude of prey and predator species — must be better understood, Barre said. Another question yet to be answered is whether declines in other types of prey in Puget Sound have caused marine mammals to eat more chinook smolts. 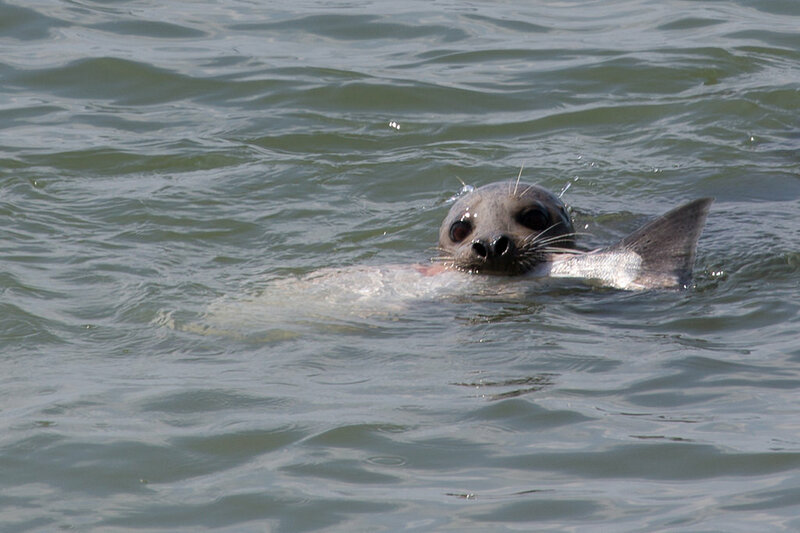 A harbor seal’s diet, after all, varies greatly but currently averages only about 7 percent chinook. That compares to a killer whale’s diet, which is believed to be 95 percent chinook in the spring and summer and about 50 percent in the fall. When a salmon run declines, the population effects of marine mammal predation are multiplied, assuming the animals consume the same number of fish, said Steve Jeffries, a marine mammal biologist for Washington Department of Fish and Wildlife and an author of the new report. For example, when the runs of threatened Hood Canal summer chum were at their lowest, harbor seals were eating about 25 percent of the adult returns to Hood Canal — and that was considered a major problem, Jeffries said. But efforts to boost the summer chum population were successful. With a larger salmon run, harbor seals were able to eat the same number of fish without making a significant dent in the spawning population. Another question yet to be answered is why the harbor seal population leveled off around the year 2000 after increasing from about 2,100 to 18,000. Jeffries said he doubts that declining chinook runs had much to do with it, since harbor seals can easily vary their diet by switching to more plentiful fish. Habitat for seals — such as the number of places where harbor seals can haul out to rest — may have declined, and that might affect the population, he said. 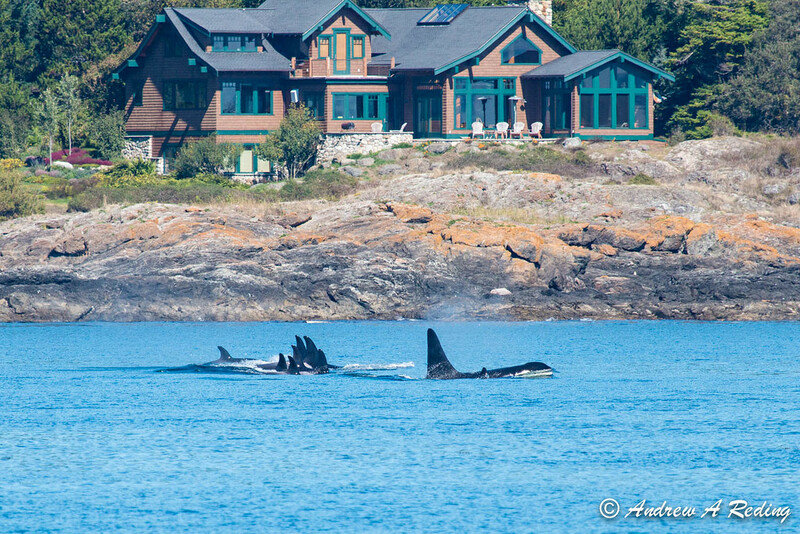 In addition, visits to Puget Sound by transient killer whales — which eat seals and sea lions — are reportedly on the increase, and that could have some effect on the population of the smaller marine mammals. Many of these questions can only be answered with more research, Chasco said, adding that the goal of the study was to identify the relative roles of known predators of chinook salmon. The paper, published online in the Canadian Journal of Fisheries and Aquatic Sciences, includes 10 authors in addition to Chasco and Jeffries. They are Isaac Kaplan, Dawn Noren, Michael Ford, Bradley Hanson and Eric Ward, all of NOAA’s Northwest Fisheries Science Center; Austen Thomas of Smith-Root in Vancouver, Wash.; Alejandro Acevedo-Gutiérrez of Western Washington University; Jonathan Scordino of the Makah Tribe; Scott Pearson of Washington Department of Fish and Wildlife; and Kristin Marshall of Cascade Ecology in Seattle.